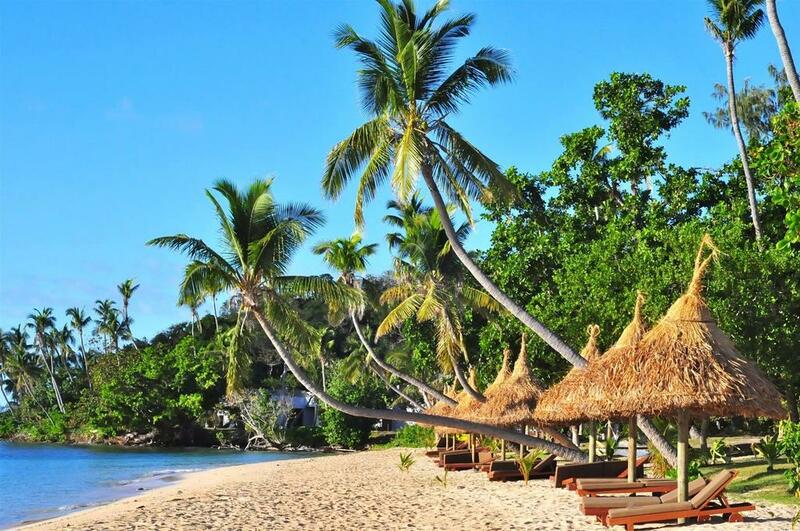 Paradise Cove Resort Fiji is 5 star Fiji island accommodation situated in the Yasawa Islands group, approximately 20 minutes from Nadi Airport by seaplane. With its white sand beaches, crystal clear waters and abundant marine life this is a tropical destination to be discovered. 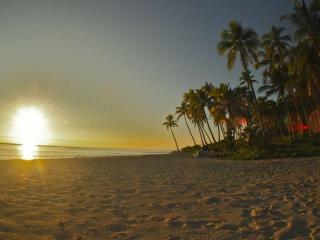 Laze the day away on the beach or at the day spa, or venture off to explore the area by diving, snorkelling or fishing. Paradise Cove Resort Fiji features an array of resort facilities including restaurant, pool bar, day spa, PADI dive operator, kids club, swimming pool and cultural activities. 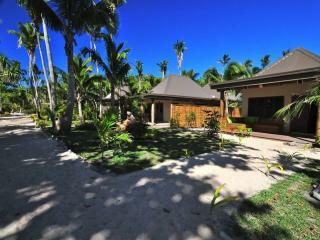 The bungalows and villas at Paradise Cove Resort Fiji offer contemporary amenities entwined with traditional Fijian decor. Offering tropical garden or ocean views and featuring spacious living areas, rooms are designed to suit couples or families. The Beachfront Villas are a few steps from the beach and are ideal for couples with private balcony and private outdoor bathroom, whereas families will love the large outdoor living and deck area in the 2 Bedroom Garden Villa. 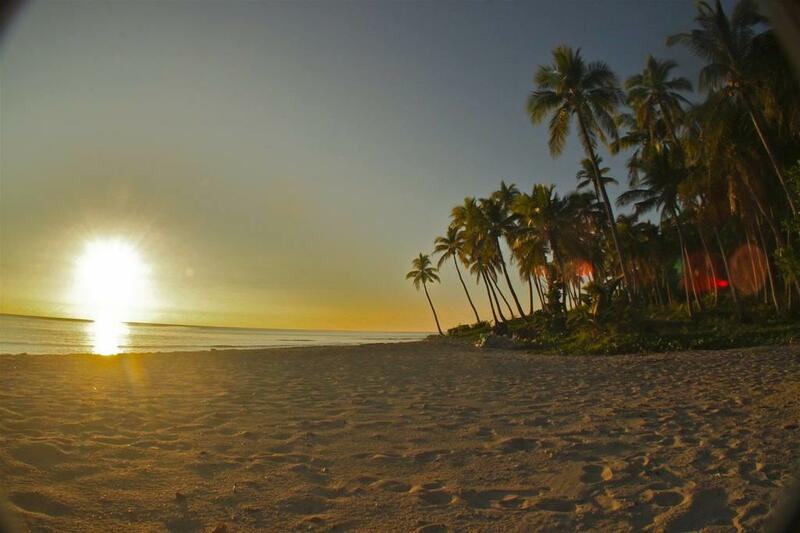 Escape to Paradise Cove Resort Fiji for your next Fiji island holiday and discover relaxation, rejuvenation and inspiration like never before. 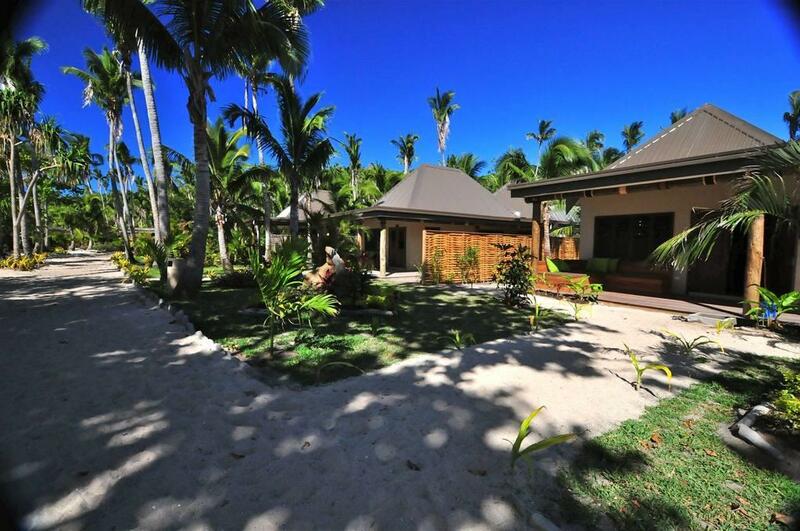 This Fiji accommodation features all the modern amenities and comforts you would expect including air conditioning, complimentary WiFi and smart TV. 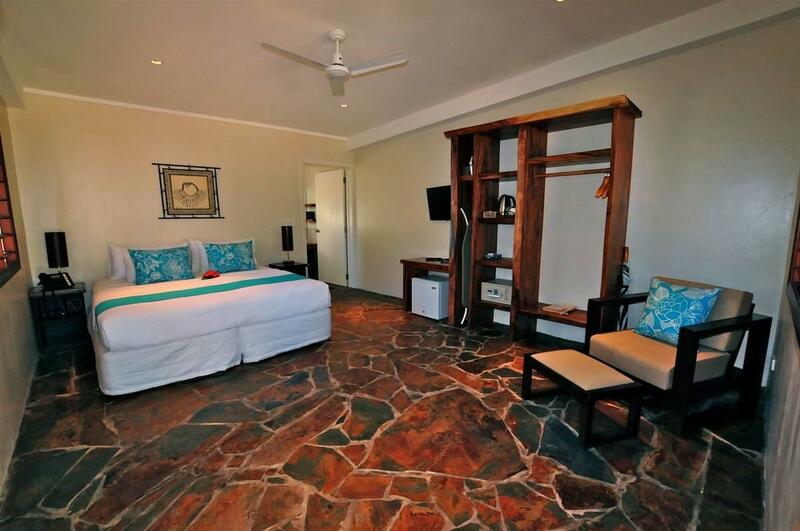 There is a range of rooms at Paradise Cove Resort Fiji to suite both couples and families, with privacy, views and spacious living being key elements of each room's design. 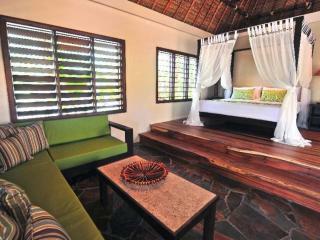 Garden Bungalow: Features local hand crafted furnishings, open air shower and private balcony overlooking tropical gardens. Bedding is 1 King Bed OR 2 Single Beds. Maximum room capacity is 3 Adults & Children. 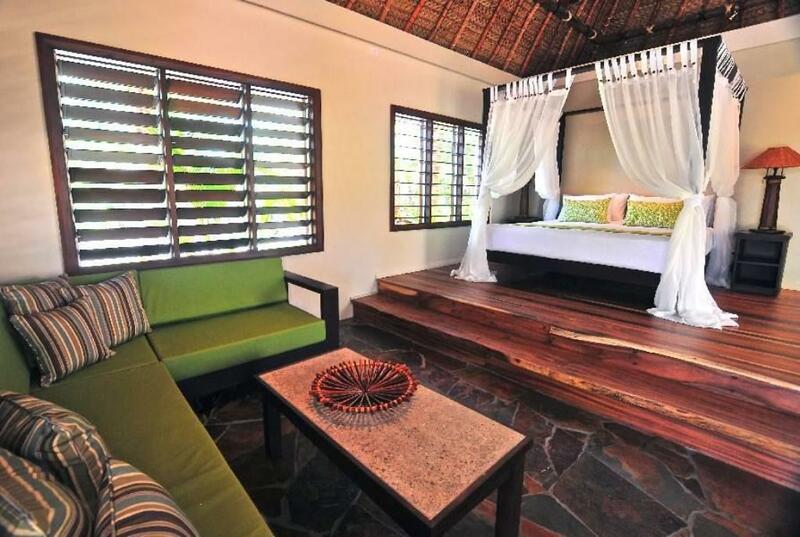 Paradise Garden Bungalow: Features an open aired ensuite in a tropical garden. Bedding is 1 King Bed OR 2 Single Beds. Maximum room capacity is 3 Adults or 2 Adults & 2 Children. 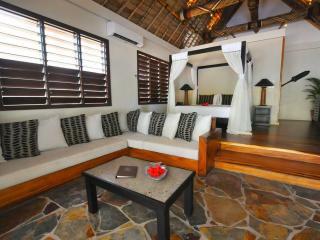 1 Bedroom Cove Villa: These Villas are located in an adults only area and have access to 2 adult only swimming pools. Features views of the lush garden area. Bedding is 1 King Bed. Maximum room capacity is 2 Adults. Note: This room type is for Adults 18+ years only. Children under 18 years are not permitted in this room type. 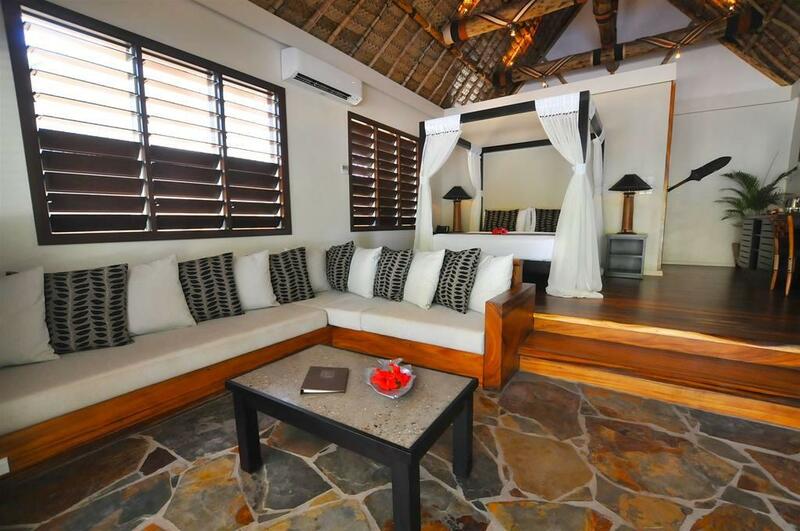 1 Bedroom Beachfront Villa: Located on the ocean front, these villas feature an outdoor garden bathroom, ocean views from the private balcony and complimentary mini bar. Bedding is 1 King Bed. Maximum room capacity is 2 Adults. Note: This room type is for Adults 18+ years only. Children under 18 years are not permitted in this room type. 2 Bedroom Garden Villa: These family friendly villas with large outdoor living area and deck, outdoor bathroom and complimentary mini bar. Bedding is 1 King Bed + 2 Single Beds OR 2 King Beds. Maximum room capacity is 6 Adults & Children. Paradise Suite: Also known as the Honeymoon Suite. 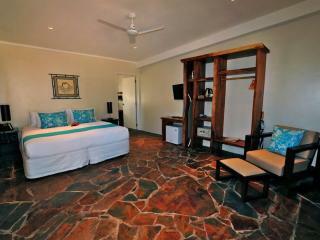 You can enjoy ocean views, complimentary mini bar, private plunge pool and private staff. Bedding is 1 King Bed. Maximum room capacity is 2 Adults. Note: This room type is for Adults 18+ years only. Children under 18 years are not permitted in this room type. 2 Bedroom Beachfront Villa: With 2 bedrooms and 1.5 bathrooms these villas offer plenty of living space and include complimentary mini bar. Bedding is 1 King Bed + 2 Single Beds OR 2 King Beds. Maximum room capacity is 6 Adults & Children. Beach House: Located on a private beach with stunning ocean views and featuring kitchen, private staff and complimentary mini bar. Bedding is 2 King Beds OR 1 King Bed + 2 Single Beds. Maximum room capacity is 4 Adults. Note: Children under 13 years are not permitted in this room type. Black Rock: Open for breakfast, lunch and dinner daily with a la carte and buffet options. 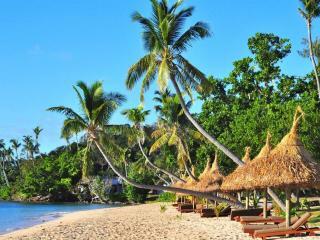 Offers Island cuisine using fresh ingredients. The Sandbar: Enjoy a refreshing drink or light snack poolside, overlooking the ocean. 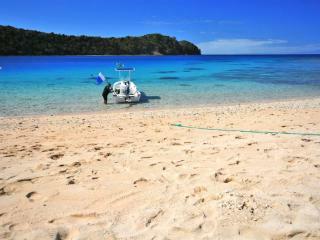 Paradise Cove Fiji has a 5 star PADI DIVE on site. Fully trained and experience divers are on hand offering all the PADI courses - first try or higher qualifications such as Advanced, Rescue or Dive Master, with a large selection of speciality dives including Night, Wreck, Deep, Peak Performance Buoyancy, All gear is supplied or guests can bring their own. The resort also offers intro dives 'Bubble Makers' for kids 8-10 years which involves a 30 minute pool session. Naika Spa: Offers a range of treatments and therapies designed to refresh and rejuvenate. Crooked Coconut Kids Club: Open daily for morning, afternoon and evening sessions for kids 3-12 years. Play games, enjoy some cooking, and explore the island at this exciting kids club. Paradise Teen Tent: The teenagers (13+) can enjoy this hang out complete with foosball, movies and a gaming console. Babysitting is also available, payable direct. 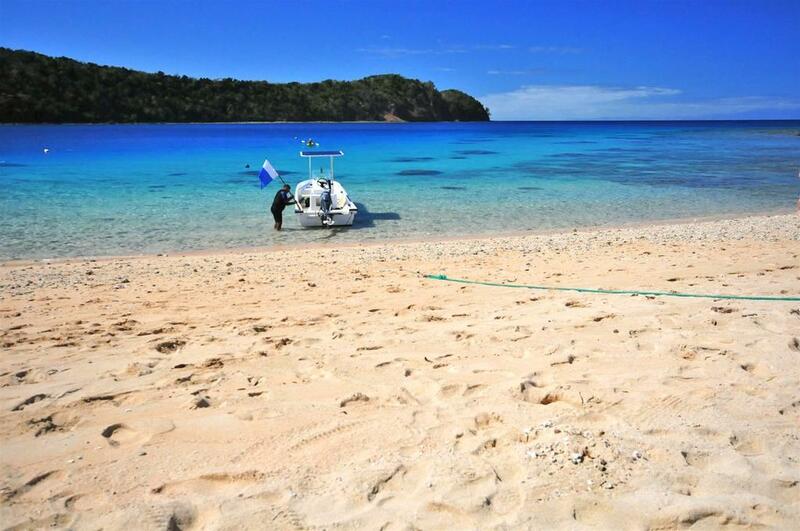 Paradise Cove Resort Fiji can be accessed by boat, seaplane or helicopter, there are several ferries running a daily service, and there is also a charter boat service. The boat transfer time is approximately 3 hours, and the helicopter or seaplane transfer is approximately 20 mins.